It is notable that as the continuing financial crisis (credit crunch, recession, sovereign debt crisis, whatever you will) develops, there are those observers who claim that capitalism itself is in crisis while others describe plainly the confusion about what economic system we currently have and what will happen if it does collapse. Will Hutton hits upon the problem (this “…entire financial edifice, underwritten by tiny amounts of capital…”) but fails to draw the logical conclusion. Unfortunately, Mr. Hutton fails to clearly define capitalism and does not show how the current system we have meets that definition. Mr. Hutton, like many critics and commentators on the current crisis, seems to lack a unified theory that allows him to fully understand the causes of the current crisis and obvious solutions. As a result, he is reduced to rather confused speculation and unsupported assertions. There is a school of thought, (to which Mr. Hutton belongs) that asserts that businesses and state work together to increase wealth for society as a whole. We are in the current mess because we have deviated from this basic principle and transformed into a system where entrepreneurs do what they want without any thought to state or society. Strangely, the actual economic system we have seems to more closely resemble Mr. Hutton’s ideal society rather than the one which he criticises – but only superficially. Government is heavily involved in business and banking, but businesses and government are necessarily antagonistic towards each other. The primary source of this antagonism is, of course, taxation wherein the government helps itself, at many levels, to shares of the business’s income. It also imposes tax collection responsibilities upon the business and the bureaucratic costs that go along with that. Capitalism may be defined as “an economic system in which the means of production are privately owned and operated for profit”. Similarly, a “free market” is one free of government control and intervention. Individuals may freely and voluntarily transact with each other with no interference from the government (which may, for example, prohibit certain services or products, or impose certain terms through legislation). There can be no crisis in such a system because it clearly is an intrinsic part of human nature. One person’s will to trade their personal property in return for personal property voluntarily traded by another. Even in the most government controlled environment (say a prison) this process of voluntary exchange will occur. It cannot be stopped. The actual system that is under threat of collapse is the system by which governments finance themselves over and above their explicit tax revenues. It is the fiat money central banking system. This system has grown and developed over the centuries and began in England during the seventeenth century with the establishment of the Bank of England. The original purpose of the Bank of England was to finance the wars of England but it is now used to indirectly finance the welfare state and the various pet projects of bureaucrats. It is the key method by which the state maintains its legitimacy as an agency with the ability to grant benefits to the populace. This is to ensure a grumbling compliance while the state significantly and covertly increases taxes, through a range of methods, to enable its continued expansion. By combining the existence of a central bank with a fiat currency and fractional reserve banking, the state can raise funds significantly in excess of the official tax rates. The central bank buys the government bonds by printing money. This purchase therefore is entirely financed by inflation. Since it’s a rare thing for a government to run a budget surplus, this debt will never be repaid. Rather there is a tendency for the debt to increase until the inevitable crisis hits. But growing interest payments on this debt lead to a smaller slice of the budget pie for the population, future higher official taxes or higher future inflation when the central bank prints more money to buy more bonds (think Quantitative Easing). In this way, the population are gradually taxed through the reduction of their currency’s purchasing power. However, there is another link in this chain: fractional reserve banks. The banks provide a capitalist veneer to the veiled and unofficial tax system. On the one hand they purchase domestic government debt which they can either hold or sell on to the central bank (for a profit). On the other hand they will buy foreign sovereign debt (such as Greek debt) which now apparently carries an implicit guarantee from the European Union and European Central Bank. These banks create new money through the fractional reserve process and in practice, for every £100 a customer “deposits” into the system, the bank lends £99. This vastly multiplies the funds available to the bank and allows them to not only increase their lending to individuals and businesses but also to governments, foreign or domestic. Moreover, in the short term, the increased supply of credit lowers the cost of this debt. It is easy to see how governments benefit from this system. It allows them, not only to benefit from inflation but to vastly increase taxes on both current and future generations! This is essentially what government debt is – a higher tax in the future. Much like a narcotic it is pleasure now but pain later. But while the governments and banks generally benefit from the pleasure, the pain is felt by the citizenry. In this manner, the government uses this cheap and apparently endless supply of credit to pursue its goals, whether they are war, welfare or infrastructure projects. Additionally, this process creates an unsustainable boom, initially raising business profits and by extension, tax revenues. This is the “financial edifice, underwritten by tiny amounts of capital”. And it is government that is responsible for its existence as well as being a major beneficiary of it. Inevitably, the boom must come to an end. Not only are banks hammered by bad debts accruing from failing businesses, or individuals who can no longer afford to pay their mortgages, but governments are hit by plummeting tax revenues at the same time that interest rates on their debt shoot upwards. For the banks the hits keep on coming with sovereign debt (from Greece, Spain, Italy and others for example) now effectively worthless and heading towards default. Therein lay the causes of the European sovereign debt crisis. Now we can see clearly that this is not a crisis of capitalism or free markets. It is a crisis of government caused by fraud on a grand scale. The fraud of the fractional reserve banks which pervert the very nature of a bank “deposit”; the fraud of the central bank which counterfeits money and manipulates prices; and finally, the fraud of the government, which as an institution has over time created this inflationary and unstable financial system as a method to surreptitiously expropriate resources from the population which it serves, in order to finance its expansion. 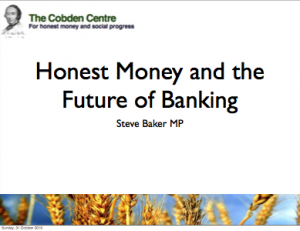 Unfortunately for the governments, they are as vulnerable to market realities as are the banks. And there is a limit to their ability to tax the population no matter what the method. The Keynesian idea was that the increased government spending financed by the inflationary banking system will boost the economy so that the government can repay debt with increased tax receipts in the future. Thus, it was believed that the boom would carry on indefinitely. However, there is no escaping economic reality and the inflationary boom must end in a bust. When the crisis initially started it was easy for governments to simply blame the banks. As we have moved from a sub-prime housing debt crisis to a sovereign debt crisis, this story is less convincing. Regardless, no matter how much governments publicly criticise the banks, they are bound to bail them out since banks are a crucial factor in government financing. And it is the population who will meet the cost of this bail-out. Free markets will survive this crisis simply because the will to voluntarily produce and trade is an intrinsic part of human nature. There is no crisis of capitalism, but there is a crisis of government. Specifically, the fraud of government debt financing is now unravelling, having come face to face with economic reality. Unwilling to confront this crisis (which would require a default by several governments at best and the likely bankruptcy of several major banks) governments will take the steps to prolong it until the inevitable and total failure of this deceitful system. Great piece, but the mainstream media do not and will not pick up the idea that he have reached this position through the failings of fiat currency and fractional reserve banking. Have we, in fact, reached a failing in democracy, a tragedy of the commons? I think the overwhelming majority of the working electorate believe they have a vested interest in kicking the can down the road, as they are either direct or indirect employees of the State or have huge debts they are happy to see inflated away. Politicians and their clients on the Right and Left have a massive interest in the status quo continuing! The author says that “a “free market” is one free of government control and intervention.” But history has taught us that government intervention in the economy is essential to make capitalism work. As an illustration of this, it is worth thinking about which are the freest, most incentive driven market economies in the world today. It turns out that the poorest countries in the world such as Congo and Sierra Leone, which have little or no government intervention in the economy, would score the highest against these criteria. I expect the situation is similar in Sierra Leone. What the people need is peace and the rule of law, not government intervention in the market. mrg, it depends on your definition of a free market. The point I was tryimg to make was that when much economic activity happens beyond government oversight, as in these countries, chaos is the result. The view presented in the article seems to be classic Ayn Rand in the sense of government having a very limited role in purely guaranteeing property rights. The problem is that the market is very good at providing some things but not others. For example, the market doesn’t seem to be able to provide healthcare or housing at reasonable cost. Another issue is that fairness does not fit into this world view, in the sense of a certain minimum social standard for all. Setting aside the question of who decides what’s ‘reasonable’, I don’t think the market has been given a chance at either housing or healthcare. The US is usually held up as an example of free market healthcare, but it is actually heavily regulated and taxpayer subsidised (the US government spends more per capita on healthcare than any European state). We’re straying from economics to philosophy here, and I’d recommend Jamie Whyte’s articles on fairness. Many libertarians would accept the argument that a certain very basic level of welfare is a public good, though it’s difficult to know where to draw the line. Personally, I think we’re wealthy enough as a society (or would be without government meddling) that purely voluntary systems would suffice (a combination of insurance, friendly societies, and charity), but the period of transition would be difficult. mrg, thanks for the article. I entirely agree with Durkin’s views on housing. But in the US, where there is no shortage of land, massive government intervention was required to increase home ownership. I think this shows that home ownership would be quite limited in a true free market. There are some good ways to bring market incentives into healthcare (healthcare in Singapore is worth looking into), but clearly the US insurance model does not work – as you say, it is far too expensive. But irrespective of this, when you are talking about people’s lives there has to be some intervention from the state to ensure that those who cannot pay get treatment. On your final point on voluntary systems – this is largely how things were done in the 19th century, before the working class had the vote. But with the rise of labour movements and the extension of democracy, the extreme levels of inequality in this sort of system could no longer be tolerated by society as a whole. And this leads to my final point – in my view the main problem with libertarian views such as this is that they are incompatible with democracy. The large mass of the population who benefit from free healthcare, education, state pension, jobseekers allowance etc. are never going to vote for these benefits to be taken away. So any debate along these lines is largely academic. There seem to be some very broad assumptions behind your thoughts here such as; individuals have a natural right to own a home, a natural right to free healthcare and that if someone cannot afford either, everyone else should be forced to pay for them. It is notable that you mention “fairness” as it doesn’t seem “fair” that the productive should be forced to pay for the unproductive. What I would say is that you have a natural right to use your own property to produce goods and sell them. You have a natural right to use the proceeds of this sale to purchase or rent a home. You also have natural right to use your proceeds to pay for medical care, education or anything you need. Why does there need to be intervention by the State to ensure people who cannot pay get any these things? The basic retort by Statists to Libertarians is generally this: “what will happen to the poor people”? I ask, what will happen to the rest of us as the State gradually expands? The answer is something similar to modern day Cuba or the Soviet Union. We will all become equal in poverty. You assume but do not prove that we would have extreme levels of inequality in a free market, yet when I look at socialist countries, that is exactly what I see. It does not follow that because we have a free market we will have extreme inequality or unaffordable healthcare. In fact, you will find that the more government intervenes the poorer these public services become and the more expensive. I put it to you, that democratic government is incompatible with freedom. Further, regardless of how the populace votes those benefits you mention will be taken away because there will eventually be no money to pay for them. I certainly wouldn’t say that individuals have a natural right to own a home. But I would say that individuals do have a right to a minimum social standard, which includes healthcare if they cannot afford it, education, and housing. I think that it is perfectly fair that the fortunate should pay for the less fortunate. My view is that much of what you are in life depends upon your natural abilities, and your start position in life, none of which you can claim to deserve. If you happen to be born into a rich family, you have a tremendous starting advantage in life compared to someone who is born into a broken home with parents who are penniless drug addicts. So in this sense it is not unfair that those who have been lucky in these things should give something back to those who have not. No, I can’t prove that there would be extreme levels of inequality in a truly free market. But there is certainly a historical pattern that when government has not intervened as much in the economy, inequality has been higher. In the states, inequality was much higher in the late 19th/early 20th century, and is in the present day, than it was in the ‘golden age’ of capitalism in the 50s and 60s. Your final point I find quite disturbing. On the contrary, democracy is essential for freedom. As Hayek said, “Democracy is essentially a means, a utilitarian device for safeguarding internal peace and individual freedom.” As soon as the government do not have to answer to the people, freedom will vanish. History provides the evidence. I would be interested to know your thoughts on how the political system should work? A dictatorship? A TYPICAL company in Congo with a gross profit margin of 20% faces a tax bill equivalent to 340% of profits. Some survive by slipping the tax collector a few Congolese francs to look the other way. This is nice for tax collectors, but not so good for Congo. Its spirit of enterprise is throttled at birth by ridiculous rules. To pick up Dan’s point, and Im not sure if this contradicts the article, in both Congo and Sierra Leone any property you own or surplus you generate is liable to get pinched off you at gunpoint. Government clearly has a role in protecting property (and life itself for that matter). I don’t think this contradicts the article. Ideally, with a limited government the role of government would be to protect property rights. This would be done on a voluntary and entirely consensual basis (i.e. the moment the government fails to respect and protect property rights the individual has the right to replace the government with another organisation to do the same). This is a different matter from onerous regulation and an extremely burdensome tax regime. What I am talking about in my article is a massive abuse of property rights by the government and its cohorts. This is economically damaging and shows that government is not performing its stated role as a protector of property rights.